While in the networking space, Hewlett-Packard Co. is seen as more of an enterprise player, the vendor says it needs to do a better job letting the market know that many of its solutions scale in the small and medium-sized business space. Once such offering was launched on Tuesday at HP’s Global Partner Conference. Looking to address the ever-popular BYOD trend, HP launched new unified wired and wireless solutions designed to deliver a unified network to support corporate BYOD policies. While most networking competitors and legacy networks have separate wired and wireless networks, which means an integration challenge when it comes to enabling BYOD, HP differentiates by offering a unified network said Bethany Mayer, senior vice-president and general manager for networking at HP. The vendor claims a unified approach can reduce operating costs by 38 per cent and eliminate as many as half the required number of network access devices. The new HP 830 Unified/WLAN Switch can support up to 1000 wireless devices. The announcement also includes other new switches and tools for access control, to enable self-onboarding of devices according to role-based policy, freeing-up IT staff to focus on more strategic priorities. While the sweet-spot for the solution is probably around 500 seats, it scales down well to organizations with as few as 50 employees said Mike Banic, vice-president of global marketing for HP networking. Among the new offerings is HP IMC User Access Manager, which Banic said creates a self-registration portal. An employee or guest can register their device on the network, and the appropriate level of access will be provisioned based on their role. Mayer told ITBusiness.ca that HP actually has a number of switches and wireless solutions that scale down as low as the “s” of the SMB space, including a user-friendly wireless access point she uses in her home that requires so little IT expertise her husband was able to set it up. But while HP actually does a lot of business in the low end of the networking market, she said it needs to do a better job getting the word out that it plays in this portion of the market. 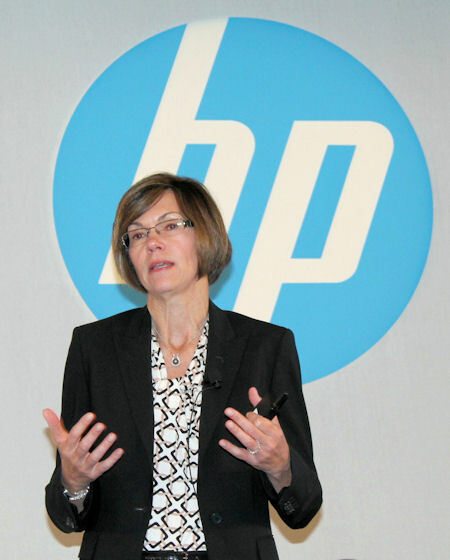 Bethany Mayer is senior vice-president and general manager for networking at HP.